Staff Sgt. Patrick F. Kutschbach, 25, was killed in action on Nov. 10, while conducting combat operations in the southern end of the Tagab valley while serving with Operational Detachmen-Alpha 021 of Company B, 1st Battalion, 10th Special Forces Group (Airborne). He deployed in support of Operation Enduring Freedom in 2007 as a member of the International Security Assistance Force – Afghanistan. He had deployed to various locations in support of the Global War on Terrorism and this was his first deployment to Afghanistan. 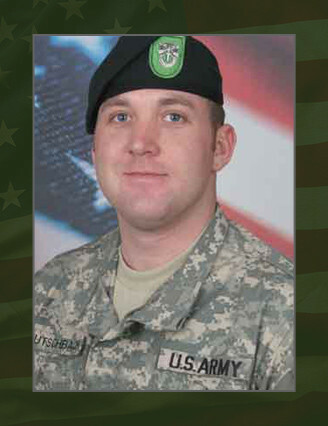 Kutschbach’s military education include; the Basic Noncommissioned Officer Course; Survival, Evasion, Resistance and Escape Course; Warrior Leaders Course, Special Forces Qualification Course, and the Basic Airborne Course. His awards and decorations include the Bronze Star Medal, Purple Heart, Meritorious Service Medal, National Defense Service Medal, Afghanistan Campaign Medal, Global War on Terrorism Service Medal, two Noncommissioned Officer Professional Development Ribbons, Army Service Ribbon, Overseas Service Ribbon, ISAF NATO Medal, Special Forces Tab, Combat Infantryman Badge, and the Parachutist Badge. Kutschbach is survived by his wife, Ginger; son, Bastian; of Atoka, Tenn.; father, David, of Pittsburgh, Pa.; mother, Debbie Huffner; and brothers David and Andrew, of McKees Rocks, Pa.